Eurofins LGS Megalab is currently the largest private health organisation in the Canary Islands in the field of clinical analyses. From the moment it was founded, it has undergone constant growth, which has made it possible to establish itself all over the Canaries with growth plans for the near future. The laboratories was set up in 1988 by Dr. D. Pedro González Santiago together with a team of professionals, with many ambitions and prospects for good results. The idea was very simple: “Laboratories where it was possible to do analyses of all kinds, where it was possible to offer a varied catalogue of products, becoming more and more extensive and attractive, adapted to the needs of our patients”. The company began in a small seventy-metre facility in Santa Cruz de Tenerife, in Calle La Rosa no. 1, first floor, which had become too small five years later. 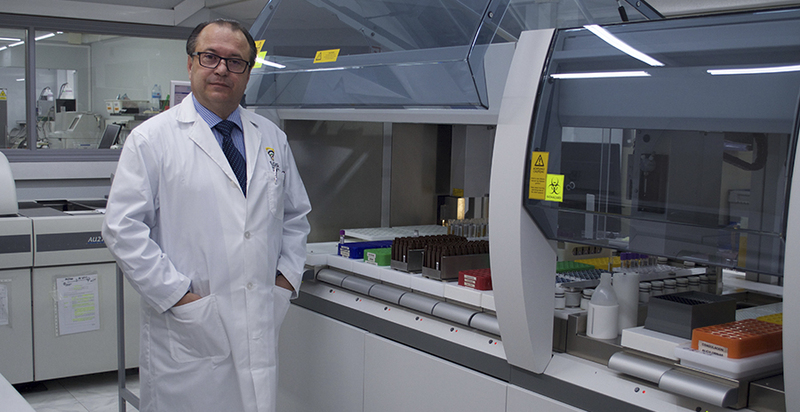 The initial project now has laboratories in all seven Canary Islands. But now they are not only working on clinical analyses but also, as a priority so as to satisfy the needs of our more and more demanding patients, apart from Private Medicine and Occupational Medicine on new products such as: Genetics and Molecular Medicine, Anti-ageing Medicine, Paternity Tests, Physical and Chemical and Microbiological Water Analysis, Cosmetics, Food and Environmental Controls. At Eurofins LGS Megalab, there are over 150 professionals working on all the Canary Islands and we have 35 centres spread around the Canaries. The business policy is “QUALITY and SERVICE”. On these two great principles and a professional and highly-motivated human team, we have established our leadership in the CANARIAN market in a short space of time. Our commitment to technological innovation and ongoing training has been shown to be the key to success in our service to Patients and Collaborators. We are a young, strong, dynamic, very experienced, consolidated and ambitious organisation. We are growing continuously, constantly entering new fields in the area of clinical and industrial analysis. We are always looking for new challenges and it is for this reason that we have, among other things, the latest technology and some professionals who are demanding in the quality of their work, and who are very willing to take on the new challenges and projects that we face. – Modern equipment in excellent operating condition to give service both on our customers’ premises and in the laboratories. – The corresponding human potential with the proper professional preparation and experience in position to carry out our work with responsibility. – A quality system based on the ISO 9001:2008 standard which ensures the proper quality of all the processes which take place in the Laboratory.